Most veterans living today were just a teenager forced to fight in the war and fight for our freedom. If you know something, you’re lucky. Do not forget to thank these war veterans. Karamihan sa mga beteranong buhay pa ngayon, teenager lang nung napilitan sumabak sa giyera at ipaglaban ang ating kalayaan. Kung may kilala ka, ang swerte mo. ‘Wag mo sana kalimutan na magpasalamat. Today, April 9, 2019 is the 77th anniversary of the fall of Bataan. About 75,000 prisoners of war, 65,000 Filipinos and 10,000 American soldiers marched at least 65 miles from Bataan to Camp O’Donnel in Capaz, Tarlac without rest, food, or water. At dawn of April 9, 1942, Major General Edward P. King, commander of the Bataan forces, was forced to surrender together with his men when the Filipino and American soldiers could no longer defend the Bataan peninsula from the invasion of Japanese troops. The surrendered Filipino-American forces were forced at gunpoint to march under the tropical hot sun from Bataan to San Fernando, Pampanga, and then taken by rail to Camp O’Donnel in Tarlac. Those who could not make it because of physical weakness were shot or bayoneted to death. The event was indeed so inhuman that it was called the “Death March” and marked the beginning of total Japanese Occupation of the Philippines during the Second World War. Despite the travails of defeat, most of the captured soldiers stood strong and heroes emerged from the event. The surrender was only temporary. Eventually, American and Filipino liberation forces retook the Bataan peninsula on February 8, 1945. 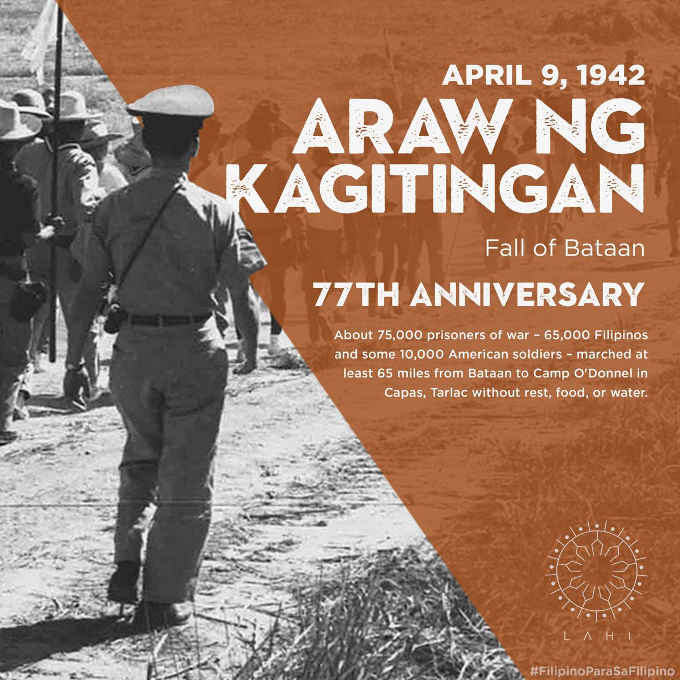 The nation marks “Araw ng Kagitingan” (Day of Valor) on April 9 of every year to highlight the valor and heroism of the Filipino and American soldiers who fought in the Philippines during World War II. Formerly called “Bataan Day” or “Fall of Bataan,” the celebration was changed to “Day of Valor” and made a national public holiday under Letter of Instruction No. 1087 issued on November 26, 1980 by then President Ferdinand E. Marcos.